This infographic features highlights from 2018 and the first 5 years of this campaign. 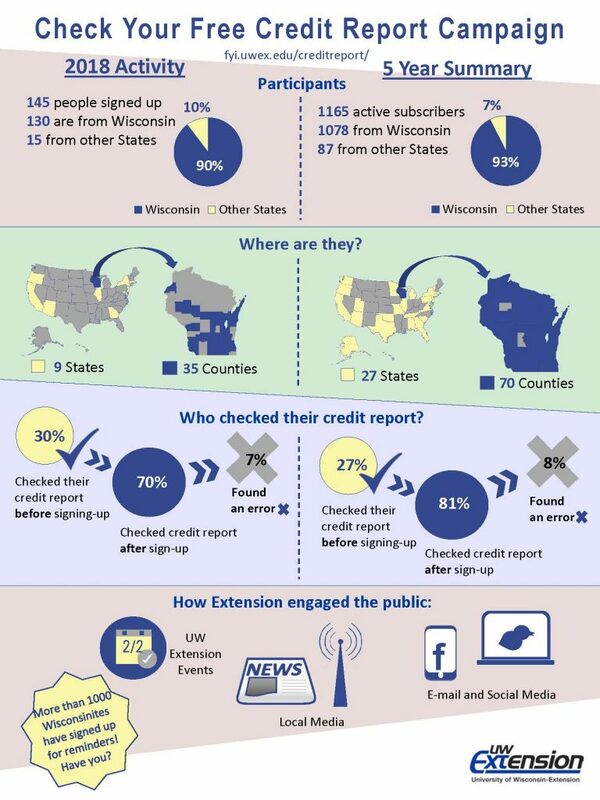 The ‘Check Your Free Credit Report” Campaign provides up-to-date information about credit reporting and encourages individuals to sign up to receive email reminders three times a year, on 2/2, 6/6, and 10/10. Join the 1,000+ people who receive email reminders to check their credit reports on 2/2, 6/6, and 10/10 each year. Sign up here. Add reminders to your Outlook or Apple Calendar for February 2, June 6, and October 10. Instructions for adding reminders to Google Calendar are available here. Submit questions to polive@wisc.edu. Your question may be answered here! A list of resources is available here. Educator resources are available on SharePoint. The University of Wisconsin Extension Family Living Programs created and maintains this website. Please email polive@wisc.edu if you have questions or feedback.